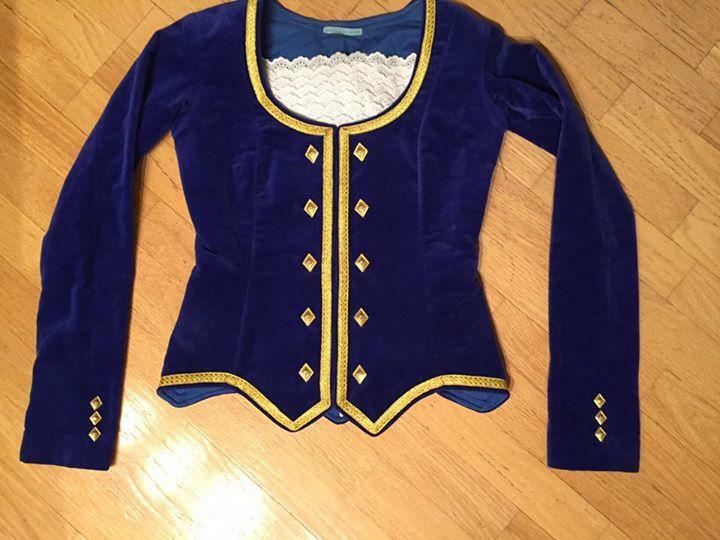 dance.net - Beautiful Blue Jacket (10245135) - Read article: Ballet, Jazz, Modern, Hip Hop, Tap, Irish, Disco, Twirling, Cheer: Photos, Chat, Games, Jobs, Events! Gorgeous highland jacket made by Gloria Weir. Shoulder to wrist 23 1/2"
Nap of neck to bottom 20.5"
Is the braiding gold or silver? I am really interested, I have sent you a message. Also what is the widest part of the arm measurement? Thanks! Yes it is gold trim. There are many dancers in Canada now getting gold over silver. Both are acceptable to the SOBHD dress code. I have another person interested as well. I don't mind whether it's gold or silver, but my daughter prefers silver. Hi! I might be interested in this jacket if one I just ordered doesn't fit. What's the measurement across the shoulders? Thanks! If this jacket is still available we would be very interested. Please let me know. Hi there! I am interested and motivated to buy. Nevermind! I think we own it... thought it might be the next size up... but it looks like the one we bought last year in early June! Ha! Is this still available? I am in Calgary and would be interested.